I forward this message to you as a model of what I hope we’ll be able to produce for the SPCS Pedagogy CoP on a regular basis. Please take a few minutes to review and tell me what you think — which features are useful, which features are useless, and which features make you excited. Any other feedback would be welcome, too! Tips and tools to support your teaching. *   Assess one or two skills per assignment rather than every element. *   Be brief: Point out what is done well, identify errors, and suggest improvements. *   Give feedback in Canvas Speedgrader<https://dartmouth.us3.list-manage.com/track/click?u=75e9597888c614ad3f957725f&id=8a0daf07cd&e=2f74651b7c> or annotate written work in DocViewer<https://dartmouth.us3.list-manage.com/track/click?u=75e9597888c614ad3f957725f&id=00cbd4fd10&e=2f74651b7c> rather than by hand. *   Create a comment bank for feedback that you use repeatedly. *   Still feeling behind the grading curve? Bail yourself out for next term with a few ideas from the Chronicle of Higher Education<https://dartmouth.us3.list-manage.com/track/click?u=75e9597888c614ad3f957725f&id=5fa98e5be6&e=2f74651b7c>. *   Visit the Registrar's guide for faculty on using Banner Student<https://dartmouth.us3.list-manage.com/track/click?u=75e9597888c614ad3f957725f&id=68d807c49a&e=2f74651b7c> for instructions on submitting final grades, citations, and incompletes. 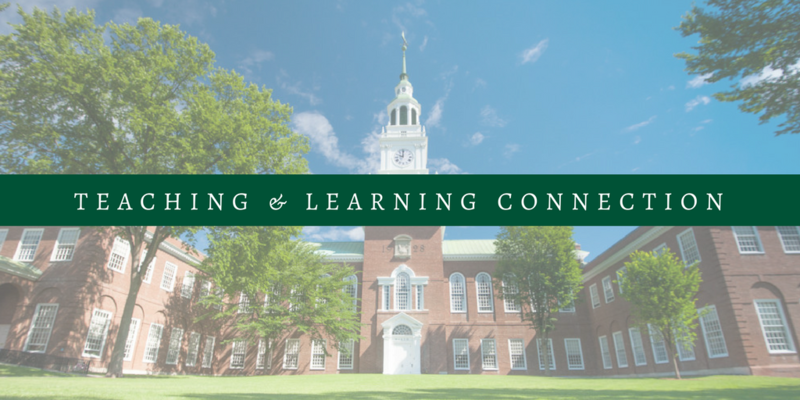 *   As always, if you’d like to discuss any of the above, or have questions about your teaching, contact the Teaching & Learning Team<mailto:dcal at dartmouth.edu>. *   Flexing due dates around flu season is a common request this time of year. Here’s how to manage it in Canvas<https://dartmouth.us3.list-manage.com/track/click?u=75e9597888c614ad3f957725f&id=b6cf770392&e=2f74651b7c>. *   Getting ready for spring courses? Here’s a refresher on copying content from one Canvas course to another<https://dartmouth.us3.list-manage.com/track/click?u=75e9597888c614ad3f957725f&id=8718013501&e=2f74651b7c> rather than starting from scratch. Reaching Everyone: Creating Inclusive Course Materials–In this workshop, participants will discuss and practice using principles of usability and accessibility as they relate to Canvas and course materials. Feel free to bring example materials, course sites, or syllabi to work with during the workshop. Feb 26, 12:15-1:30 pm Register here<https://dartmouth.us3.list-manage.com/track/click?u=75e9597888c614ad3f957725f&id=a989d820d4&e=2f74651b7c>. Teaching Science Seminar: Teaching Confessions–Join us to share your past teaching experiences, whether good or bad, and learn from others about what works and what doesn't. Come with a story or a listening ear to reflect on the skills of instruction needed in the classroom or lab. March 14, 12:15-1:30 pm. Register here<https://dartmouth.us3.list-manage.com/track/click?u=75e9597888c614ad3f957725f&id=1f897e4c0e&e=2f74651b7c>. The Dartmouth Stamps Scholars Program is accepting applications from current sophomores and juniors now through February 22. Scholars receive up to $10K per year to pursue an experiential learning plan of their own design. Read more, and refer students here<https://dartmouth.us3.list-manage.com/track/click?u=75e9597888c614ad3f957725f&id=0d791afd81&e=2f74651b7c>. The STEM Education Team at the Yale Poorvu Center for Teaching & Learning is seeking undergraduate level STEM instructors for a survey investigating the supports and obstacles that instructors face when implementing evidence-based teaching practices. Take the survey<https://dartmouth.us3.list-manage.com/track/click?u=75e9597888c614ad3f957725f&id=7484ccccef&e=2f74651b7c> before April 1. Open Education Initiative–In partnership with DCAL, the Library has launched an initiative to support the use of open educational resources in teaching Dartmouth courses. Learn more about these resources<https://dartmouth.us3.list-manage.com/track/click?u=75e9597888c614ad3f957725f&id=583bef94cc&e=2f74651b7c>, and how they can save students money and allow instructors to customize materials according to course needs. Grant funding and support available beginning March 8<https://dartmouth.us3.list-manage.com/track/click?u=75e9597888c614ad3f957725f&id=44e2113871&e=2f74651b7c>. Klara Barbarossa '20<https://dartmouth.us3.list-manage.com/track/click?u=75e9597888c614ad3f957725f&id=35503bc1a5&e=2f74651b7c> is investigating whether and how virtual reality perspective-taking influences human perception and understanding of others. Gabe Zuckerberg '20<https://dartmouth.us3.list-manage.com/track/click?u=75e9597888c614ad3f957725f&id=9d3095153d&e=2f74651b7c> is working to preserve the musical traditions of the Ramaniotes, an ancient community of Greek Jews. Feedback welcome! Tell us what you think of the Teaching & Learning Connection, and what you’d like to read about in future issues. This message is brought to you by the Teaching & Learning Community at Dartmouth College.